Stylish functionality, multiple compartments and spacious interior. The outside left side pocket with Magnetic buckle can provide quick access to wipes, right side pocket with insulated material can keep the temperature of baby bottle . Insulated bottle pocket holds up to 3 baby bottles to optimize temperature control. 100% polyester with high quality. Environmental material and waterproof, easy to wipe clean. Nice Stitching, well made. So the bag can be used for a long time without damage. Padded shoulder straps plus back breathable air mesh panels for the ultimate carrying experience. 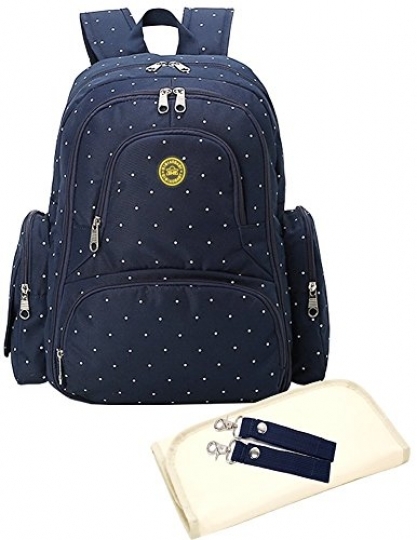 Multi-function backpack also can be used as a daily backpack, like laptop backpack and travel backpack. With padded pockets and can hold 15″ laptop. Choice of easy-tote handle or padded shoulder straps or stroller clips offer all day comfort.